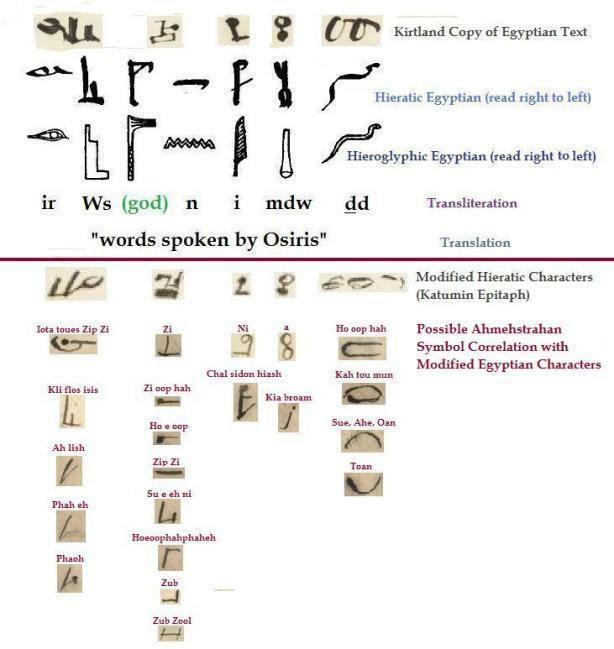 Esoteric interpretations of "words spoken by Osiris"
Its true that the Nauvoo publication of the "Book of Abraham" involved "A TRANSLATION of some ancient Records [more than one] ... from the catacombs of Egypt" (Book of Abraham, Introductory Paragraph); but there was no papyrus scroll written by Abram among the ancient Egyptian records that Joseph Smith interpreted. The Book of Abraham as published by the Prophet Joseph Smith, is an inspired augmentation, a redacted and amplified restoration of an ancient text that was written by Abram "while he was in Egypt". But neither the original, nor a papyrus copy of Abram's writing came by mummy to "Latter Day" Kirtland, Ohio. According to the Bible, the Hebrew prophet was not called "Avraham" (Abraham) when he sojourned in Egypt. He went by "Avram" (Abram) then. (Bereshit (Gen.) 11:17-18) Joseph Smith later replaced "Abram" appearing in earlier Book of Abraham manuscripts, with "Abraham", even though the Prophet knew that this change constituted an anachronism. (3) a few symbols from the Amenhotep Book of the Dead, the inspired interpretation of which seems to connect with the account of "the daughters of Onitah" recorded in Abraham 1:11. Elder Cowdery wrongly identified the Ta-sherit-Min Book of the Dead as the writings of the biblical patriarch Joseph. According to Brother Cowdery, the ancient text appeared to him to be written in a form of Hebrew. The scroll is actually written in hieratic Egyptian. LDS Scripture and the Joseph Smith Papers do not state that the Prophet had an ancient scroll of the Book of Abraham in his possession. The simplistic idea that the Book of Abraham was found on a mummy, was publically communicated by other brethren. Dubious statements on the subject (not clearly coming from Joseph Smith) found there way into LDS works like the redacted History of the Church - which has become something of an embarrassment to LDS scholars. The references to HC vol. 2, pp. 235, 236, 348-351 have been removed from the current, revised, and edited introduction to the Book of Abraham. For reasons that may in part have to do with the interests of Joseph Smith's audience, the revealed Hebraic pearl that is the Sepher Avram (Book of Abram) was couched by Joseph Smith in an anachronistic, quasi Egyptian clamshell - an intriguing but unoriginal embellishment consisting of redacted facsimiles from more than one papyrus scroll, none of which were made by a Hebrew prophet. Order of "the Hidden Cubit" , "Amat-Sitrah", "אַמָת-סִתְרָה"
The published Book of Abraham has three facsimiles that derive from Egyptian funerary art. The second of these (a redacted hypocephalus) brings to mind a strange pearl inserted between the folds of revealed scripture. The original "pearl of great price" in this case, is the Hebraic text itself. The text of the Book of Abraham mentions only one "representation" including a set of "figures at the beginning". There is no mention in the scripture of two more facsimiles. The original illustration and "hieroglyphics" prefacing the Sepher Avram are lost to the ages. Surviving copies of the sacred text were supplemented with suitable illustrations (reinterpreted) from available Egyptian funerary art. These are the "Ah meh strah ans" - the name coming from the Joseph Smith Egyptian Papers. We are talking about an esoteric society that celebrated religious syncretism; in particular, a society that recognized the Hebrew GOD. We are talking about "Egyptians" like those described in Yesha’Yahu (Is.) 19:21. In addressing the readership of the Times & Seasons newspaper, it is understandable that Joseph Smith would refer to the "Ah meh strah ans" as simply "the Egyptians". This general term might with some appropriateness apply to a variety of peoples who settled near the Nile and its delta. Historically, Semitic Hyksos, and even certain Greeks could qualify as "Egyptians". But for more scholarly discussions on the Book of Abraham, greater specificity is called for. Fortunately the Prophet Joseph Smith gave us the name of the particular "Egyptians" we should be talking about in relation to the Book of Abraham. Though the Ahmehstrahans might have actually lived in, or near the second century BCE (Ptolemaic times), they apparently claimed to connect with the Egyptians (ha-Mitsrim) of Avram’s day. Hence the reference in Joseph Smith's "Grammar & Alphabet of the Egyptian [Ahmehstrahan] Language" to Abraham [Abram] being "forewarned of God to go down into Ah meh strah, or Egypt, and preach the gospel [b'sorah] unto the Ah meh strah ans". Hieratic Egyptian did not exist in Avram's day. The text of the Book of Abraham appropriately makes reference to "hieroglyphics", not hieratic script. The esoteric, modified hieratic of Joseph Smith's "Egyptian" alphabet, dates his Ahmehstrahans. Consider also the fact that Joseph Smith's Egyptians appear to have been familiar with Hebrew and Greek. Though they claimed to be the keepers of terminology dating back to Adam, it is also clear that the esoteric society utilized linguistic innovations from much later times. Some of the Ahmehstrahan society would likely have congregated at Alexandria and frequented the great libraries. The plural patriarchal name "Mitsrayim" might be related to the Hebrew word "matsor" connoting defensive or protecting borders - a bulwark or refuge provided by a mighty river, sea or a rock. (Yesha’Yahu (Is.) 19:6) But "Ahmehstrah" also sounds like "amah" + "sitrah" or "amat-sitrah" meaning "mother-city of protection (shelter, covering, hiding-place)". "Amat-Sitrah" might then have suggested to the Ahmehstrahan mind the veiled cosmic heart, the hiding place of Deity (the Elohim), the divine protecting arm, the celestial cubit, the covered bride of the heavens. See LDS Scholar Ed Goble, "Kolob Character Comparisons, Visual Affinities and Mythological Background". See also "Meanings of Kolob" at the end of Ahmehstrahan Counting and Gematria . "Egypt" to the Ahmehstrahans, may have been seen as an earthly imitation, a reflection of things they perceived in the heavens. The Prophet Joseph Smith was inspired to do what the Ahmehstrahans did in preserving, and enhancing their version(s) of the ancient Sepher Avram. Joseph, like the Ahmehstrahans of old, borrowed from available Egyptian art a suitable substitute for the long lost "representation at the commencement" of the Sepher Avram. (Abraham 1:12-14) Joseph Smith was inspired to see in the first vignette of the Hor Book of Breathings the desired replacement, which he adapted. This is how the Book of Abraham started. Beyond this, the first English manuscripts of the Book of Abraham show strange correspondence between the Book of Abraham text and samples of Egyptian characters copied from the commencement of the Book of Breathings. The same kind of esoteric correlation exists between badly copied hieratic characters from the Amenhotep papyrus (a separate scroll), and a revealed account having to do with the Book of Abraham's "Onitah" or rather "On-i-tas" (spelled "Onitas" in the Grammar and Alphabet of the Egyptian [Ahmehstrahan] Language, pg. 5). This strange correspondence is not a direct translation. It should be abundantly clear from the sparse selection of Egyptian characters tied to Joseph's "Translation", that the Prophet did not regard the Hor Book of Breathings, or any of the other papyri at hand, as the actual source of the Book of Abram. Joseph Smith's authoritative signature appears at the beginning of the "Valuable Discovery ..." note book containing the characters copied from the Amenhotep Book of the Dead. Professor of Egyptology Robert K. Ritner has identified the hieratic symbols "some in mirror image" (flipped) associated with Joseph Smith's "Translation". It just so happens that the same Egyptian words appear above the raised hand of the goddess Maat (who serves to represent a "Prince of Pharaoh" in Book of Abraham Facsimile No. 3, Fig. 4.) depicted in the last vignette of the Hor Book of Breathings. = dd mdw in Wsir = "words spoken by Osiris"
As if that weren't perplexing enough, the Prophet Joseph relates the same Egyptian characters (also appearing in the Amenhotep papyrus) to the epitaph of a "Princess, daughter of On-i-tas Pharaoh King of Egypt...". See Ritner's transliteration above. What in heaven's name is going on?!! (1) First, note that the sense in which the hieratic Egyptian is read appears to have been understood by the Prophet Joseph Smith. The hieratic, like Hebrew, or like the apparent movement of the lunar phases (viewed from earth's northern hemisphere), progresses right to left. Joseph Smith got this right despite the "terrible" copying jobs performed by his unwitting scribes. (2) Egyptian characters can be read in mirror image (flipped) format. Joseph Smith appears to have grasped this as well. (3) While Facsimile No. 3, Figure 4. has a female standing in for a "Prince", the Joseph Smith "translation" from the Amenhotep's papyrus seems to associate a "Princess" with a male! The thing that is common to both cases is that Joseph seems to recognize in the apparently versatile symbols the theme of a child of Egyptian royalty. ( + ) = "mdw in" [copied in reverse order] who began to reign in the year of the world 2962. = "Wsr" Katumin was born in the 30th year of the reign of her father, and died when she was 28 years old, which was the year 3020. The Egyptian temple banner hieroglyph (signifying a god), does not participate in the phonetic spelling of the name "Wsir", "Osiris". Ritner ignores the fact that the banner symbol is combined with the character, and proceeds with the conventional transliteration "mdw in". Notice how few Egyptian characters accompany the Katumin text. You don't have to read hieratic or hieroglyphic Egyptian to discern that the Egyptian symbols are not the source of the text. Joseph Smith probably didn't think the Egyptian characters were the source of the text either. The numbers alone, cited in the epitaph, are more than the Egyptian symbols can account for. The numbers mentioned in the Katumin epitaph are: 2962, 30, 28, 3020. Except for a possible correlation between the copied hieratic characters and the prophetic symbols for the numbers 2 and 8 , featured in Ahmehstrahan Counting, there doesn't appear to be much numerical correspondence between the copied hieratic characters and the revealed epitaph. = 8 + 10 x 2. The prophetic symbol for 10, called "Tah", appears to be a combination of the ancient cross mark, "tav" (making a "T" sound), and a hieratic circular sieve sign (making an "h" sound). Strange though it may seem, Joseph Smith appears justified in this numerical name. 28 is the age of the Egyptian princess when she died! This appropriately spells the numerical name "Ni". This also happens to be the reverse of the Egyptian word "in", read in the opening line of the Amenhotep text. The prophetic symbol for 2 also somewhat resembles the post-exilic Hebrew letter bet (ב) which is numerically equivalent to 2. See Ghubari numerals. How could Joseph Smith have connected such things? Both the Ahmehstrahan counting system and standard Egyptian numerals are base 10 systems. Neither system uses zero as a numeral place holder. Despite their connections to hieratic letters, and possibly also hieratic numerals, Ahmehstrahan counting symbols appear similar to "Arabic numerals" of Northern Africa. See Ahmehstrahan Counting and Gematria . The Prophet likely believed that the Egyptian signs on the papyrus only correlated with the revealed Katumin text, and that the signs did not completely contain the Princess' epitaph. But not willing to grant so much common sense to Joseph Smith, Ritner cynically huffs, "Thus Smith's elaborate translation corresponds to only the first four words of [the Amenhotep text]"
Ah, but what might multilingual Ahmehstrahans have seen in these few Egyptian symbols? The repetitive "d" sounds in "dd mdw" calls to mind the Hebrew equivalent "devarim diber" = "words spoken". Each of the Egyptian picture symbols (hieroglyphs) can be related to a Hebrew word which the hieroglyph depicts. Let each hieroglyph stand for the first letter in the Hebrew word associated with the picture, and then let us see what word(s) the group of symbols spell out. This approach is comparable to spelling Semitic words using the Protosinaitic aleph-bet. Although, we will come to see that the Ahmehstrahan assignment of Hebrew letters to Egyptian symbols is more variable. The Ahmehstrahans became very adroit at expressing their religious syncretism through a kind of esoteric polysemy. Interpreting Egyptian symbols the Ahmehstrahan way, is comparable to solving quadratic, or even higher order equations. Such equations typically have more than one solution (by analogy: interpretation or theme). A musical analog might be found in a Bach fugue - with its polyphonic, multiple musical melodies, masterfully played together. Its ok for a verse or set of symbols to have several different meanings! In the case of "words spoken by Osiris" written above the hand of the goddess Maat (as depicted in Book of Abraham Facsimile No. 3), one can invision a staff, or sign pole (Heb. "nes", נס) with a fiery serpent (Heb. "saraph", שׂרף), the ripples of the Nile (Heb. "Y'or", יאוֹר), and a papyrus reed (Heb. "eveh", אבה). The Hebrew/Egyptian characters may then be interpreted to read "prince of god Wsr (Osiris, Pharaoh in the after life)" which can be seen as a reference to the sky god Horus (Hor). Hor happens to be the name of the owner of the papyrus Breathing Permit! For more meanings and discussion of Facsimile 3 see "JOSEPH SMITH LEARNS TO THINK LIKE AN AH-MEH-STRAH-AN" at the end of Note 4, in "Abraham in Egypt and the Papyrus Solar Ferry"
But how might a "Princess" be seen in these same symbols? is again seen as a "fiery serpent" or Hebrew "saraph". But "saraph" sounds rather like "Sarat ..." which means "Princess of ..." We might consider an instance of wordplay here. Hebrew wordplay occurs frequently in the Bible. Consider the words "sarey Par'oh" translated "princes of Pharaoh". The word "sarey" may be seen as a play on words with the name of Avram's wife "Sarai" in the peccant scene of Bereshit (Gen.) 12:15. The Eternal would later take a letter "hey" (ה) from his own name and change "Sarai" to "Sarah" (שׂרה), "Princess". Reading "saraph" as "Sarat ...", "Princes of ...", does seem to correlate with the first line of the epitaph: "..Princess ... of On-i-tas ..."
The equivalent copied hieratic symbols in Joseph Smith's "translation" of this line are grouped in a curious manner. They are in reverse order from how they appear in the Amenhotep papyrus . That's strange! Why did Joseph Smith have his scribe copy the characters in reverse order? Could it be to facilitate a reinterpretation in Hebrew? Perhaps the letters are in proper order when read in Hebrew. If so they should be read right to left. Let represent a "river", "nahar" (נהר) in Hebrew (e.g. the Nile). So the phonetic value of this symbol (in this case) is the same as it is in Egyptian - "n". The symbol represents the Hebrew letter "nun" (נ). To the Ahmehstrahan mind, "nun" may recall Nu the Egyptian goddess of the primordial watery abyss. The "walking stick hieroglyph" , "sign post", "pole" or "staff" ostensibly supporting the fiery serpent, looks very much like the single "stroke sign". This symbol, curiously separated from the serpent in the Princess Katumin epitaph, can be associated with the number "one". The number "one" in Hebrew is represented by the letter "aleph" (א). Another Hebrew word for "sign" (אוֹת) is also spelled with an "aleph". Thus the Hebrew word "nasa" (נסא) with the rare but acceptable spelling "nun", "samakh", "aleph" arises. This word means lift up, raise up, or exalt as in raising up a "n'si", an "exalted one", "prince", "chief" or "ruler". The ascension of a king can be suggested. The ancient word "nasa" thus seems to tie in nicely with its associated line "who began to reign ..." in Joseph Smith's Katumin epitaph. The "banner" ("ntr" in Egyptian), "nes" (in Hebrew), spelled "nun, "samekh" , נס is therefore appropriately connected to the letter "nun". It is literally combined with the n-water ripple symbol in the Kirtland "Valuable Discovery ..." notes. There is in fact both a Hebrew and Egyptian justification for this tie. Lastly, we see the name of Osiris, the resurrected judge of the dead "Wsir" (the banner symbol reassigned as previously noted). The name "Wsir" incorporates the "throne" symbol, and correlates with kings of Egypt and the afterlife. These symbols appropriately touch upon the last line of the epitaph: "... born in the 30th year of the reign of her father, and died when she was 28 years old ..."
= dd-mdw in Wsir = "words spoken by Osiris"
The saraph (fiery serpent) raised up upon a pole (Bemidbar (Num.) 21:8) can be looked upon as a combined symbol signifying "Sarat ...", "Princess of ...", or the oronym "Sarah aph", "Princes also". The advantage here of combining symbols is that they can reinforce meaning in both phonetic and thematic ways. We have seen how the composite character , or combines symbols to reinforce meaning. Meaning can similarly be reinforced in combining the serpent and the pole. It is understood that "sarah", "princess" is an "exalted person" - lifted up. So we have both a phonetic correlation (similar sound) and a thematic correlation (being lifted up). We may also recall an instance in Hebrew scripture in which a "rod", "staff" or "shaft" became a "serpent" ("nahash", Shemot (Ex.) 4:2-3). Thus both symbols together may connote either the raised "saraph" (i.e. Bemidbar (Num.) 21:8), or potentially, serpents (more than one); in that when the rod is cast down on the ground it becomes another serpent. Note the similarity between the Hebrew word "mateh" (מַטֶה), translated "rod" in Exodus 4:3 (KJV), and the Egyptian = "mdw". Choosing to see the serpent/pole sign as a "sign" (אוֹת), pronounced "ot", we may, by admitting a Hebrew "vav" or "nail" (ו), see in "Sarat", "Sarot", that is, "Princesses" (more than one). In due course we will see that the Ahmehstrahan word "kah tou mun" and the very name "Katumin" correlate to these same symbols. Start with the Greek word "ophin" (όφιν) translated "serpent" in ST John 3:14 (KJV). This word describes the messianic symbol lifted up by Moses. Investigate Greek words befitting of the characters in "dd mdw in Wsir". See if any significant correlation in Greek can be found relating to the Katumin text, or to Book of Abraham Facsimile No. 3, Fig. 4.
, "papyrus reed", "eveh" in Hebrew is spelled with an aleph (א). , "river", "nahar" in Hebrew is spelled with a nun (ן, נ at the end of words). may also be seen to represent "Egyptian royalty", "the divine throne". ≈ "Princess of On of the divine throne"! It happens that the banner hieroglyph (Egyptian symbol for god), also has the phonetic value "ntr". Moreover, the throne symbol can make the sound "ws", "as" or "os" as in "Osiris". ≈ "Princess, also On-ntr-as (On-it-as King of Egypt)". Finally, the eye hieroglyph (for good or evil) makes a sound like "ir". A Hebrew word for "city" is pronounced "ir". "Ir" also sounds like "Ur", the land and city (possibly the same as Urkesh) in the land of the Kasdim. By Ptolemaic times, "Kasdim" was erroneously and anachronistically translated "Chaldees". See Genesis 11:31, KJV; Abraham 2:1, and Septuagint, Genesis XI.28, 31, where "Ur Kasdim" (Hebrew) is rendered "land of the Chaldees" in Greek. Inaccurate though it may be, "Chaldees" and "Chaldeans" is now standard scriptural (KJV) terminology. In relation to the topic of the daughters of Onitah in the land of the Kasdim, one may perceive in the symbols above, the subtle hint of a Hebrew term for "enemy", "adversary". This same term may be seen in 1 Shemu’El (1 Sam.) 29:4. Here the term is used in a relative sense. David was perceived as a potential "adversary" by the Pelishtim (Philistine) princes. "words spoken by Osiris ..." above the hand of the goddess of truth and justice. Vignette from the lady Nefir-ir-nebu's Book of the Dead (Joseph Smith Papyri collection). Additionally, this monogram brings to mind "Yaho – Saraph", "The Eternal [is the] Saraph" which sounds like "Yehoseph" (Tehilim (Ps.) 81:5) meaning "the Eternal adds". The shortened form of this latter name is "Yoseph", meaning "he will add (gather)". The biblical mispronunciation of the Egyptian name bestowed on Yoseph, is "Zaphnath-paaneah" (Genesis 41:45, KJV). Assuming that Moses actually wrote Genesis (Genesis in fact is a redacted work), some might level the same criticism against the lawgiver as is flung at the Prophet Joseph Smith - that he didn't know Egyptian. In addition to knowing Egyptian, Hebrew, Greek, etc. the Ahmehstrahan society developed there own esoteric system of symbols. This "language" employed modified, and reinterpreted hieratic characters. The fact that Joseph Smith gave different interpretations in relation to the same Egyptian words (e.g. "dd mdw in Wsir") shows that the Prophet's inspired lists and notes on the Ahmehstrahan language do not guarantee unequivocal, exclusive translations. 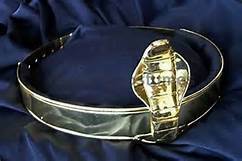 Just as Hebrew correlations can be made wth "words spoken by Osiris"; manifesting a "Prince ..." in one case, and in another case a "Princess ...", so it will be seen that in correlating the same Egyptian symbols with Ahmehstrahan, both a "princess" and a "prince" appear as potential interpretations. Polysemy is involved, whether we are trying to correlate Egyptian symbols with Hebrew, or Greek, or to the esoteric characters in Joseph Smith's catalog. Do not expect Joseph Smith's Ahmehstrahan notes and lists to produce the Book of Abraham entire from symbols found in the Hor Book of Breathings, or to produce the complete Katumin epitaph from characters appearing in the Amenhotep Book of the Dead. The Prophet's "Egyptian" material only aids in discovering transtextual correlations between Egyptian characters and the texts that he received by revelation. See Ed Goble, "Katumin the Princess, Royal Female Lineage, and the Cobra (Iaret or Uraeus)"
is the modified symbol, or combination of symbols, shown at the commencement of the Katumin epitaph. In copying the Amenhotep text, Joseph Smith's scribe depicted the original hieratic character thus: It is as if the Prophet's scribe was trying to discern and copy a double serpent, or a character that looked more like (Möller, Reptilien 248), than like (Möller, Reptilien 250). The following selections from Joseph Smith's Grammar and Alphabet of the Egyptian [Ahmehstrahan] Language appear to correlate with the modified hieratic characters associated with the revealed Katumin epitaph. These unedited selections are given to raise the interest of the reader - to encourage more exhaustive exploration of Joseph Smith's Grammar and Alphabet of the Egyptian [Ahmehstrahan] Language. Note that the Ahmehstrahan symbol , and term "Kah tou mun" relates to "a lineage ... descent from her by whom Egypt was discovered ... a Royal family ..." Though the name sounds similar to "Katumin", and may in fact be that same, the symbol does not exclusively refer to the Princess. The symbol can also apply to a male descendent (e.g. "Prince of Pharaoh ...") of "her by whom Egypt was discovered..."
That a "Crown" or serpent headdress, is suggested by the symbol is made clear by its connection with and the explanation, "Ho oop hah Queen Kah tou mun ... Crown of a princes[s] ..." This begs the question , do characters associated with "words spoken by Osiris" in anyway spell out "Kahtoumun", "Katumin"? We might see in the first hieratic sign , and its associated hieroglyph , an Egyptian crown or serpent headdress viewed from the side. A Hebrew word for "crown" is "keter" (כּתר). "Keter" is related to the verb "katar", meaning to "surround, encompass". Here then is an appropriate correlation with the Ahmehstrahan symbol . To see "Katoumun" or "Katumin" spelled out in the characters of "dd mdw in ..." we need to return to the arrangement of the characters as they appear in the Egyptian papyri. Remember this is not the rearrangement of the modified characters in the Katumin epitaph. The characters correlating to lines in the epitaph follow an alternate interpretation scheme (previously shown). ≈ "Keter-min of the divine throne". With the "rod" or "staff" separated from the "serpent crown", "Keter" (כּתר), we choose to associate the Egyptian "staff" symbol ("mdw" = "words") with the Hebrew word for "staff" or "rod", "mateh" (מַטֶה). Here, both the Hebrew and Egyptian words associated with this symbol make an "m" sound; so in this case the justifiably represents the consonant mem (מ). That being said, a vowel sound between "Keter" and "m" may also be suggested in the resemblance of to the Hebrew letter vav, or waw (ו). The nail sign vav makes an "o" (וֹ), "u" (וּ) or "w" sound, as in "Kahtoumun" or "Katumin. Here as before, the "papyrus reed" , "eveh" (אבה) represents aleph (א). The three Hebrew letters spelling "eveh" (אבה), appear in the same order in "Avraham" (אברהם). It is appropriate that the Ahmehstrahans related papyrus to Avraham. LDS scholar Ed Goble elaborates on this. Also as before, the n-water ripple symbol , calling to mind Nu, and the Nile (Νειλος), can represent the Hebrew letter nun (ן at the end of words); nun being the first letter in the Hebrew word "nahar", "river". is then pronounced "in" (i.e. the Egyptian), "on" (אֹן), or "un" (אֻן) etc. depending of the sound of the aleph (א). We therefore have "Keter-u-min" or "Keter-ou-mun". The Hebrew pronunciation possibilities agree with the variety that Joseph Smith revealed. LDS Scholar Ed Goble calls attention to the connections between the Egyptian words "kt" or "kty" and the royal iaret (upright serpent symbol, crown or headdress ornament). Preferring Egyptian words which sound like "kt" over the Semitic word "keter", we hone in on the Ahmehstrahan word "Kahtoumun", and name "Katumin". 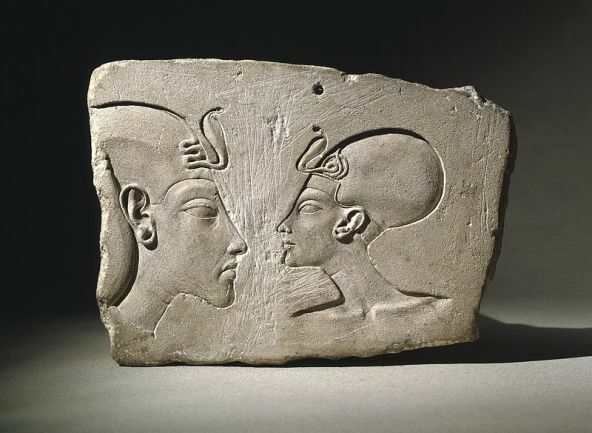 Female and male Egyptian royalty depicted - "khat" headdress on the left. ≈ "Khat-oum-un, the divine throne". Thus a "Prince of Pharaoh ...", descendent of "Queen Kah tou mun" may be seen in the symbols. Alternately, "Katumin, Princess, daughter of ...King of Egypt ..."
Much as a cobra shuffles off its coils, so the soul that is the living essence, the "ka", leaves behind the "khat", the mortal body. The Ahmehstrahans perhaps perceived in the name "Ka tumin", "Soul of perfections", "Soul of the south", "Soul of the right hand". Note: "Onitas" likely represents the Ptolemaic Ahmehstrahan pronunciation of the name "Onitah" found in scripture (i.e. the more ancient Hebraic Book of Abram). Note also the Ahmehstrahan princely crown symbol "Ho e oop hah" which agrees with standard Egyptian crown symbols. Ed Goble directs our attention to the symbol (Möller, Reptilien 246). The Ahmehstrahans would certainly have perceived a serpent and crown, among other things, in this hieratic representation. Note in the above explanations, the relation between the cosmic governing power Kli flos isis, represented by the throne symbol , and the veiled, governing body Kolob near the heart of celestial creation. Consider the parallel between the Eternal's creative female companion Hokhmah ("Wisdom", Mishle (Prov.) 8:1-36) and the Egyptian throne goddess Isis. Hebrew Abecedarius and Joseph Smith's Ahmehstrahan "translations"
א All of the Egyptian art and symbols that Joseph Smith used to supplement the revealed text of the Book of Abraham came from more than one Egyptian papyrus. The Prophet knew this. This is why, in his introduction to the scripture "purporting to be ... the BOOK OF ABRAHAM", the Prophet used the description "A TRANSLATION Of some ancient Records [plural] ... from the Catacombs of Egypt ..."
The Egyptian trappings of the Book of Abraham do not date back to the prophet Abram, but more nearly fit Ptolemaic times. During this time period, translators at Alexandria, Egypt were hard at work on the Greek translation of Hebrew scripture, the Septuagint. They had a Greek speaking audience in mind. Did the Ptolemaic Ahmehstrahans similarly have a goy audience in mind? Is this one of the reasons that anachronistic, quasi Egyptian things were added to the Book of Abram? Surprisingly, after much annoyance, controversy, and conflict the things of the Ahmehstrahans augmenting the Sepher Avram, are seen to evince Joseph Smith's prophetic connections. But the two-edged sword of truth cuts both ways. It divides asunder the erroneous tradition that a papyrus scroll of the Book of Abraham arrived in Ohio with mummies. Joseph Smith's definition of "translation" is a prophet's definition. What is really going on with the Book of Abraham is perhaps better described (academically) as transtextual correlation. Even this terminology falls short of describing transcendent connections between the ancient writings of Abram and more recent Egyptian funerary texts. The act of interpreting a text draws on things beyond the text itself, and it can be argued that no work is the work of one author. Could it be that certain writings are guided by higher intelligence, that is, by consciousness that human authors may or may not be conscious of? ב Bereshit (Gen.) 17:5 explains that the name "Avram" ("Exalted Father") with the divine addition of the letter "hey" (ה), was changed to "Avraham" because he (the Hebrew prophet) was to become an "Av" (אב), or "father" of "hamon goyim", "many nations". The Prophet Joseph Smith's amplification of the Sepher Avram may be seen to represent a broadening of the audience, an outreach to include the nations foretold in Avraham's later, greater blessing. This inspired work thus truly became a "Book of Abraham", "father of goyim", having a version of the ancient original Sepher Avram at its heart. Transtextual correlations between Egyptian symbols and Joseph Smith's revealed texts can be compared to acrostic Hebrew scripture. In the case of the Book of Abraham there are thematic, or subject correlations between esoteric interpretations of Egyptian symbols, and portions of the scriptural text. In acrostic alphabetical poetry, the letters of an alphabet (in regular order), correlate with the first letter of the first word, commencing each portion of text (for instance in a psalm, proverb or lamentation). Not all acrostic alphabetical psalms in the Bible succeed in having a perfect correspondence, in regular order, with letters of the aleph-bet. Take for instance Tehilim (Psalms) 9; 25; 34; 37. Its hard to believe that a psalm is written in the form of an abecedarius only to serve as a mnemonic device. No one expects the alphabetical symbols themselves to be sufficient to supply the whole text. It is as if the writer is moved upon to return a literary bread offering to God (an abecedarian psalm, proverb or lamentation) based in part on grain (the aleph-bet) which is acknowledged to have come from God. Tehilah (Ps.) 119 is a prime example of a Hebrew abecedarius. Without inspiration the symbols of the aleph-bet alone could not produce this psalm. Likewise, symbols from the first few lines of the Hor Book of Breathings could never produce the Book of Abraham, nor the first four words of the Amenhotep Book of the Dead reveal the epitaph of Princess Katumin. It takes inspiration to bring forth the rest, and inspiration suggests an author apart from the author. That's transtextuality. Is it only coincidence that the first word spelled in the aleph-bet is "AV" (אב)?